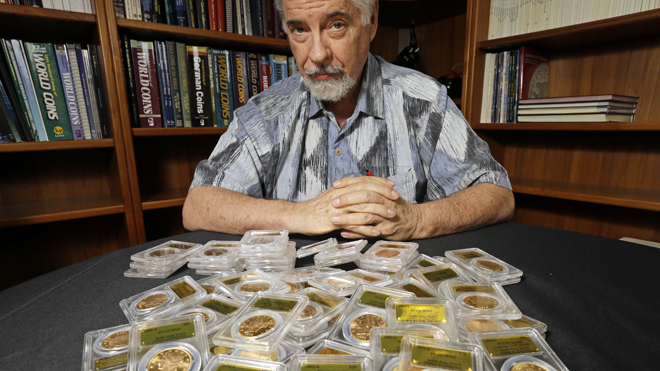 One couple’s gold find could mean a jackpot for the IRS. The Northern California couple that found $10 million worth of rare, mint-condition gold coins buried in the shadow of an old tree on their property will likely owe about half the find’s value whether they sell the gold or not. The San Francisco Chronicle reports that the find is a taxable event under a 1969 federal court ruling that held a “treasure trove” is taxable the year it was discovered. “If you find and keep property that does not belong to you that has been lost or abandoned (treasure-trove), it is taxable to you at its fair market value in the first year it is your undisputed possession,” the report said, citing the IRS tax guide. The report says after all is said and done, about 47 percent will go to state and federal tax, or the top tax rate. An accountant told the paper that the couple can try to fight the tax and claim it was there when they bought the property. Nearly all of the 1,427 coins that were found, dating from 1847 to 1894, were in uncirculated, mint condition, said David Hall, co-founder of Professional Coin Grading Service of Santa Ana, which recently authenticated them. Although the face value of the gold pieces only adds up to about $27,000, some of them are so rare that coin experts say they could fetch nearly $1 million apiece.